Two new fact-checking browser extensions are trying something really challenging: automating the fact-checking process. By generating algorithmic scores for news online, these extensions are predicting whether particular web pages are likely to be true or false. We wondered if these products could really provide such a critical service, so we ran an analysis. Our finding? They are ambitious, but they are not quite ready for prime time. During the course of several weeks, we ran 219 stories from 73 different media organizations through these extensions — NewsCracker and FactoidL— and tracked the algorithmic scores assigned to each story. The stories ranged from hard news and long-form features to sports and entertainment. NewsCracker does not promise the truth, but it does “come pretty close.” Web pages receive ratings on a one to 10 scale for headline strength, neutrality and accuracy, which are then averaged into one overall score. NewsCracker trusts the article when the overall score is above 8.0, and it does not trust the article when the score is below 6.0. Articles scoring between 6.0 and 8.0 trigger a cautionary warning. 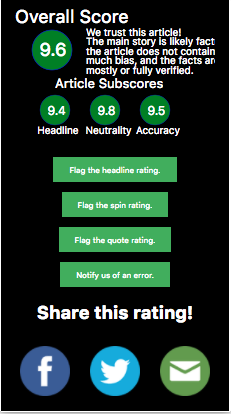 According to NewsCracker’s website, ratings are generated according to several criteria, including preliminary scores assigned to specific websites, the number of news outlets reporting on the same story, the number and sourcing of quotations, the number of biased words or phrases and the sentence length and structure. To assess the validity of a story’s factual claims, NewsCracker identifies “the five most important factual claims” and checks for their repetition in related news coverage. Of the 219 stories we tested, 145 received ratings above 8.0, 65 received ratings between 6.0 and 8.0 and seven received ratings below 6.0 — meaning 66 percent of stories were dubbed trustworthy while only 3 percent were labeled “fake news.” NewsCracker “could not detect any news to score” from the final two stories we tested, both of which came from The Chronicle at Duke University. The Washington Post had the highest average overall score, at 9.4, with Reuters finishing not far behind. InfoWars, Twitchy and American Thinker recorded the lowest average overall scores. Significantly, local and campus news organizations — including The Durham Herald-Sun, The Boston Globe and The Chronicle at Duke University — had average overall scores below known fake news producer YourNewsWire.com as well as several other hyperpartisan outlets, such as Breitbart News. This may be because local news coverage is not often repeated elsewhere. FactoidL’s formula is simple. it identifies the number of fact-checkable statements — which it calls “factoids” — in any given story, and then Anaxagoras cleans each “factoid” by removing all “unimportant words” and queries Wikipedia for matches to the remaining words or phrases. 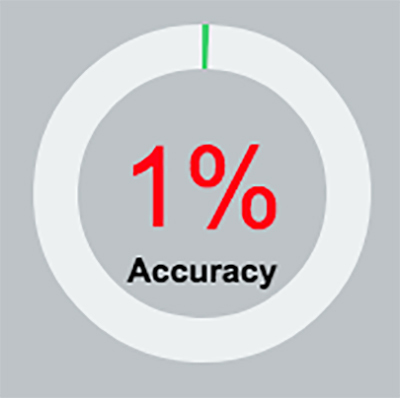 For any web page, users can see the number and list of “factoids” as well as an accuracy percentage for the page. This process is currently defective — most likely because only statements that align with Wikipedia descriptions are identified as true or accurate. 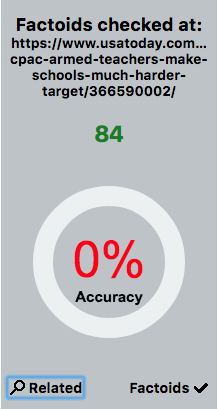 The 219 stories tested turned out an average of approximately 60 factoids and an average accuracy percentage of approximately 0.9 percent. Of these 219 stories, 154 were rated as 0 percent accurate, while 12 were rated as 5 percent accurate or higher and only one was rated as high as 10 percent accurate. The story with the highest number of “factoids” — from YourNewsWire.com — registered 2,645 “factoids,” but many could be discounted as claims that were not factual. FactoidL has a tendency, for example, to mark the dateline, byline and headline of a story as “factoids.” It often counts opinion statements, as well. Where NewsCracker is not yet ready for prime time, FactoidL has a long way to go. Very few news articles from reputable journalistic outlets are actually less than 10 percent accurate. The fact that FactoidL rated all stories tested by the Lab as less than 10 percent accurate implies that the extension is not just “hit-or-miss” with its algorithm; it is missing every time. The code powering FactoidL is available on GitHub, and interested parties can provide feedback or even volunteer to contribute. Any new technology is going to hit some bumps along the way, with bugs and breakdowns to be expected. These young developers are trying something really ambitious in a way that is both innovative and exciting. We admire the spirit of their extensions and hope to see them developed further. The number of fact-checkers around the world has more than tripled over the past four years, increasing from 44 to 149 since the Duke Reporters’ Lab first began counting these projects in 2014 — a 239 percent increase. And many of those fact-checkers in 53 countries are also showing considerable staying power. This is the fifth time the Reporters’ Lab has tallied up the organizations where reporters and researchers verify statements by public figures and organizations and keep tabs on other sources of misinformation, particularly social media. In each annual census, we have seen steady increases on almost every continent — and the past year was no different. The 2018 global count is up by nearly a third (31 percent) over the 114 projects we included in last year’s census. While some of that year-over-year change comes because we discovered established fact-checking ventures that we hadn’t yet counted in our past surveys, we also added 21 fact-checking projects that launched since the start of 2017, including one — Tempo’s “Fakta atau Hoax” in Indonesia — that opened for business a month ago. And that list of startups does not count one short-run fact-checking project — a TV series produced by public broadcaster NRK for Norway’s national election last year. That series is now among the 63 inactive fact-checkers we count on our regularly updated map, list and database. Faktisk, a Norwegian fact-checking partnership that several media companies launched in 2017, remains active. Elections are often catalysts for political watchdog projects. 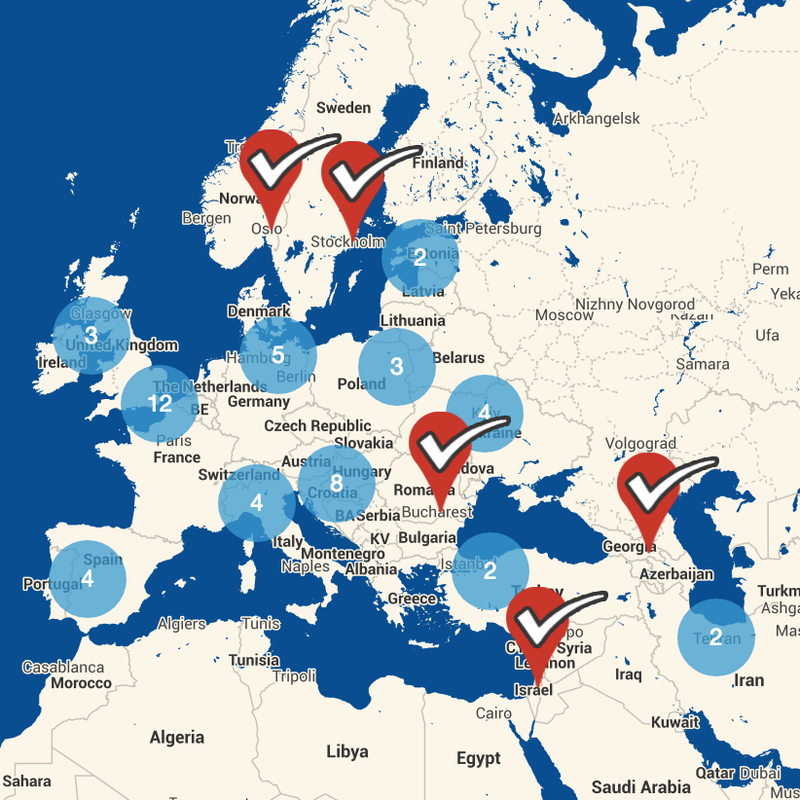 In addition to the two Norwegian projects, national or regional voting helped spur new fact-checking efforts in Indonesia, South Korea, France, Germany and Chile. Many of the fact-checkers we follow have shown remarkable longevity. Based on the 143 projects whose launch dates we know for certain, 41 (29 percent) have been in business for more than five years. And a diverse group of six have already celebrated 10 years of nearly continuous operation — from 23-year-old Snopes.com, the grandparent of hoax-busting, to locally focused “Reality Checks” from WISC-TV (News 3) in Madison, Wisconsin, which started fact-checking political statements in 2004. Some long-term projects have occasionally shuttered between election cycles before resuming their work. And some overcame significant funding gaps to come back from the dead. On average, fact-checking organizations have been around four years. One change we have noted over the past few years is some shifting in the kind of organizations that are involved in fact-checking and the way they do business. The U.S. fact-checker PolitiFact, for instance, began as an independent project of the for-profit Tampa Bay Times in 2007. With its recently announced move to Poynter Institute, a media training center in St. Petersburg, Florida, that is also the Times’ owner, PolitiFact now has nonprofit status and is no longer directly affiliated with a larger news company. That’s unusual move for a project in the U.S., where most fact-checkers (41 of 47, or 87 percent) are directly affiliated with newspapers, television networks and other established news outlets. The opposite is the case outside the U.S., where a little more than half of the fact-checkers are directly affiliated (54 of 102, or 53 percent). The non-media fact-checkers include projects that are affiliated with universities, think tanks and non-partisan watchdogs focused on government accountability. Others are independent, standalone fact-checkers, including a mix of nonprofit and commercial operations as well as a few that are primarily run by volunteers. Fact-checkers, like other media outlets, are also seeking new ways to stay afloat — from individual donations and membership programs to syndication plans and contract research services. Facebook has enlisted fact-checkers in five countries to help with the social platform’s sometimes bumpy effort to identify and label false information that pollutes its News Feed. (Facebook also is a Reporter’s Lab funder, we should note.) And our Lab’s Google-supported Share the Facts project helped that company elevate fact-checking on its news page and other platforms. That’s a development that creates larger audiences that are especially helpful to the big-media fact-checkers that depend heavily on digital ad revenue. The worldwide growth in fact-checking means more countries have multiple reporting teams keeping an ear out for claims that need their scrutiny. Last year there were 11 countries with more than one active fact-checker. This year, we counted more than one fact-checker in 22 countries, and more than two in 11 countries. As the fact-checking community around the world has grown, so has the International Fact-Checking Network. Launched in 2015, it too is based at Poynter, the new nonprofit home of PolitiFact. The network has established a shared Code of Principles as well as a process for independent evaluators to verify its signatories’ compliance. So far, about a third of the fact-checkers counted in this census, 47 of 149, have been verified. The IFCN also holds an annual conference for fact-checkers that is co-sponsored by the Reporters’ Lab. There is already a wait list of hundreds of people for this June’s gathering in Rome. The United States still has far more fact-checkers than any other country, but growth in the U.S. was slower in 2017 than in the past. For the first time, we counted fewer fact-checkers in the United States (47) than there were in Europe (52). While the U.S. count ticked up slightly from 43 a year ago, some of that increase came from the addition of newly added long-timers to our database — such as the Los Angeles Times, Newsweek magazine and the The Times-Union newspaper in Jacksonville, Florida. Another of those established additions was the first podcast in our database: “Science Vs.” But that was an import. “Science Vs.” began as a project at the Australian public broadcaster ABC in 2015 before it found its U.S. home a year later at Gimlet Media, a commercial podcasting company based in New York. Among the new U.S. additions are two traditionally conservative media outlets: The Daily Caller (and its fact-checking offshoot Check Your Fact) and The Weekly Standard. To comply with the IFCN’s Code of Principles, both organizations have set up internal processes to insulate their fact-checkers from the reporting and commentary both publications are best known for. Another new addition was the The Nevada Independent, a nonprofit news service that focuses on state politics. Of the 47 U.S. fact-checkers, 28 are regionally oriented, including the 11 state affiliates that partner with PolitiFact. We originally expected the U.S. number would drop in a year between major elections, as we wrote in December, so the small uptick was a surprise. With this year’s upcoming midterm elections, we expect to see even more fact-checking in the U.S. in 2018. The Reporters’ Lab is a project of the DeWitt Wallace Center for Media & Democracy at Duke University’s Sanford School for Public Policy. It is led by journalism professor Bill Adair, who was also PolitiFact’s founding editor. The Lab’s staff and student researchers identify and evaluate fact-checkers that specifically focus on the accuracy of statements by public figures and institutions in ways that are fair, nonpartisan and transparent. See this explainer about how we decide which fact-checkers to include in the database. In addition to studying the reach and impact of fact-checking, the Lab is home to the Tech & Check Cooperative, a multi-institutional project to develop automated reporting tools and applications that help fact-checkers spread their work to larger audiences more quickly. Following a historic pattern, the number of American media outlets verifying political statements dropped after last year's presidential campaign. 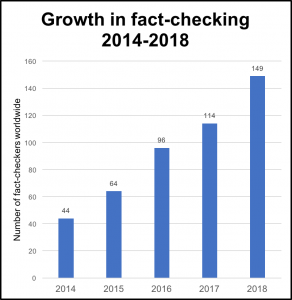 All the talk about political lies and misinformation since last year’s election has been good for the fact-checking business in the United States — but it has not meant an increase in fact-checkers. In fact, the number has dropped, much as we’ve come to expect during odd-numbered years in the United States. We’re still editing and adding to our global list of fact-checkers for the annual census we’ll publish in January. Check back with us then for the final tally. But the trend line in the United States already is following a pattern we’ve seen before in the year after a presidential election: At the start of 2017, there were 51 active U.S. fact checkers, 35 of which were locally oriented and 16 of which were nationally focused. Now there are 44, of which 28 are local and 16 are mainly national. This count includes some political fact-checkers that are mainly seasonal players. These news organizations have consistently fact-checked politicians’ statements through political campaigns, but then do little if any work verifying during the electoral “offseason.” And not all the U.S. fact-checkers in our database focus exclusively — or even at all — on politics. Sites such as Gossip Cop, Snopes.com and Climate Feedback are in the mix, too. The story is different elsewhere in the world, where we have seen continuing growth in the number of fact-checking ventures, especially in countries that held elections and weathered national political scandals. Again, our global census isn’t done yet, but so far we’ve counted 137 active fact-checking projects around the world — up from 114 at the start of the year. And we expect more to come — offsetting the number of international fact-checkers that closed down in other countries after the preceding year’s elections. Still, the number of U.S. fact-checkers accounts for about a third of the projects that appear in the Reporters’ Lab’s database, even after this year’s drop. A handful of U.S. newcomers began fact-checking in 2017. One was Indy Fact Check. It’s a project of The Nevada Independent, a nonprofit news site based in Las Vegas. The Independent got its feet wet in January with a look at the accuracy of Gov. Brian Sandoval’s 2017 State of the State address before launching a regular fact-checking series in June. 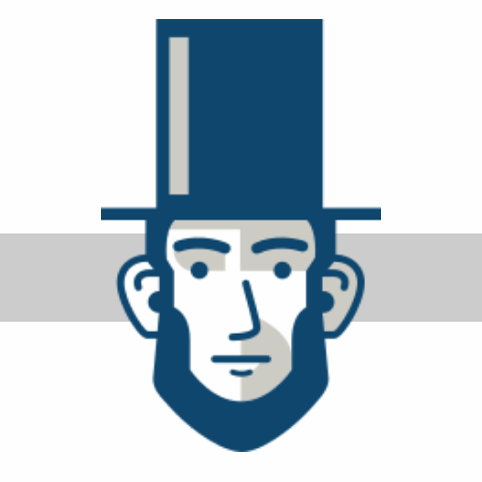 To rate the claims it reports on, Indy Fact Check uses a sliding, true-to-false scale illustrated with cartoon versions of Abraham Lincoln. The facial expression on “Honest Abe” changes with each rating, which run from “Honest as Abe” and “Almost Abe” on the true side to “Hardly Abe” and “All Hat, no Abe” on the false side. One of Indy Fact Check’s regular contributors is Riley Snyder, who previously was the reporter at PolitiFact Nevada at KTNV-TV (13 Action News). KTNV was one of several local news outlets owned by Scripps TV Station Group that briefly served as PolitiFact state affiliates before closing down the partnership — after the 2016 election, of course. So in Nevada at least, one site closes and another opens. Another new player in the U.S. fact-checking market this year was The Weekly Standard. This conservative publication based in Washington has a dedicated fact-checker, Holmes Lybrand, who does not contribute to the political commentary and reporting for which the Standard is generally known. With this structural separation, it recently became a verified signatory of the International Fact-Checking Network’s code of principles. The Standard is owned by Clarity Media Group, a division of the Anschutz Entertainment Group that also publishes the Washington Examiner and Red Alert Politics. By January, we may have a few more additions to add to our 2017 tally, but that won’t change the bottom line. This was a year of retraction in the U.S. That’s similar to the pattern our database shows after the last presidential election, in 2013, when PunditFact was the only new U.S. fact-checker. But the numbers began to grow again a year later, during the midterm election in 2014, and continued from there. Because of the large number of candidates and the early start of the 2016 presidential debate and primary process, a number of new fact-checkers launched in 2015. So we’ll be watching for similar patterns in the United States over the next two years. Student researcher Riley Griffin contributed to this report. From phone apps to browser extensions, the landscape of fact-checking tools is growing — but how many of them are useful? It is no secret that news consumers are finding it increasingly difficult to separate fact from fiction, especially when it comes to politics. Sure, they can visit journalism’s traditional truth-seeking outlets — such as PolitiFact or FactCheck.org — if they are looking for the whole story. But what if they want a quicker fix? What if they want to know, with the click of a button, if the article they are reading may include fabricated content? Well, there may now be an app for that — in fact, many apps. 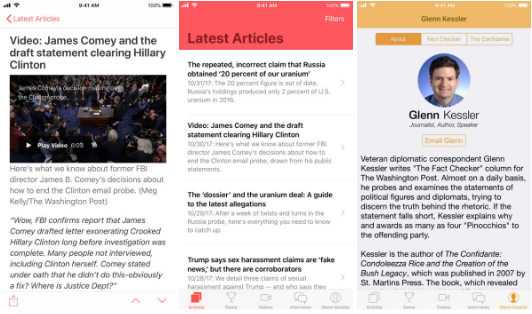 The wave of falsehoods that dominated the 2016 election cycle has inspired several enterprising companies and individuals to create mobile applications and web browser extensions to promote fact-checking and detect stories with falsehoods. In a recent analysis for the Reporters’ Lab, I identified at least 45 fact-checking and falsehood-detecting apps and browser extensions available for download on the Apple or Android app stores, the Google Chrome web store and Firefox. Many share similar design characteristics and functionality. Several of the best apps and extensions simply make fact-checks more accessible. These apps, including Settle It! Politifact’s Argument Ender, let users view and filter through fact-checks aggregated from online fact-checking sites. (Disclosure: Bill Adair, director of the Reporters’ Lab, contributed to the creation of this app.) Some, like The Washington Post’s RealDonaldContext, are specifically tailored to fact-check President Donald Trump’s tweets. A few extensions — such as FakerFact or NewsCracker — evaluate credibility online by generating algorithmic scores to predict whether particular web pages are likely true or false. I found both extensions questionable because it is not clear which inputs are driving their algorithms. But they show nonetheless that fully automated fact-checking may not be so far away — even if FakerFact and NewsCracker are themselves lacking in transparency and value. Other extensions enable users to crowdsource fact-checks. Users of these community-oriented platforms can flag and provide fact-checks online for other users to see. Where these extensions fail, however, is in training their users to fact-check. My analysis noted that several users have submitted fact-checks for opinion statements — and several others have disputed statements on a hyper-partisan basis. Many of the existing apps and extensions are designed to spot, detect or block false stories. Some alert readers to any potential “bias” associated with a website, while others flag websites that may contain falsehoods, conspiracy theories, clickbait, satire and more. Some even provide security checks for spear phishing and malware. One drawback to these apps and extensions, however, is that their assessments are subjective — because all such apps and extensions are discretionary, none can honestly claim to be the end-all arbiter of truth or political bias. In summary, some of the identified apps and extensions — like FactPopUp, our own Reporters’ Lab app that provides automated fact-checks to users watching the live stream of a political event — show signs of being on the cutting edge of fact-checking. The future is certainly bright. But not all of the market’s apps and extensions are highly effective in their current form. Fact-checking and falsehood detection apps and extensions should be considered supplements to — not replacements of — human brain power. Given that caveat, below are three of what I found to be the most refined options. They are ready for action as news-reading supplements. GlennKessler, available for free download on Apple’s app store, is an aggregation of fact-checks from Glenn Kessler of The Washington Post’s Fact Checker. Kessler’s son, Hugo, created the app when he was 16 years old. Users of GlennKessler can view fact-checked claims and filter them according to the number of “Pinocchios” they received or the political party of the speakers. The app also includes videos related to fact-checking and interviews with Glenn Kessler, as well as a game where users can test their fact-checking knowledge. As an added feature, users can learn about and email questions directly to Kessler himself. A related extension, the Official Media Bias Fact Check Extension, highlights “bias” within Facebook’s news feed. Users can ask the extension to eliminate sources fitting a particular “bias” rating from appearing in their feed. Unfortunately, this “collapse” feature brings with it the possibility that users will abuse the extension to reinforce existing filter bubbles within an increasingly fragmented social media landscape. It is important to remember as well that Media Bias Fact Check claims to find “bias” according to its own labeling methodology. This is a complicated assessment, so users should take the ratings with a grain of salt. As committed as a site may be to the truth, there can truly be no definitive rating for something so sensitive as political bias. 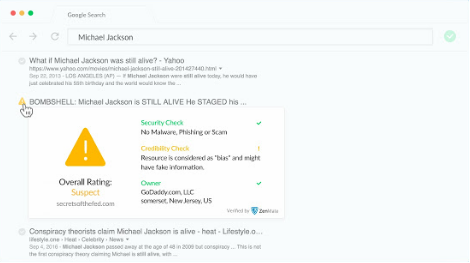 ZenMate SafeSearch and Fake News Detector, a free extension for Chrome browsers from the Berlin-based startup ZenMate, signals whether a website is “good” or “suspect.” Users see ratings not only of a website’s credibility, but also of its security and ownership. 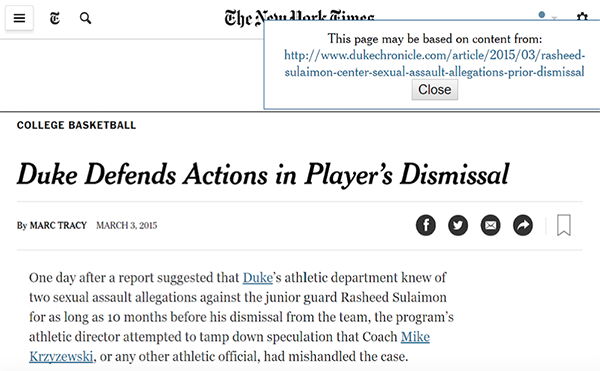 The extension does not work for articles appearing on social media. Per the extension’s description, ZenMate SafeSearch “aggregates and enriches various databases and feeds” in order to assess the credibility of various webpages. I found this low level of transparency alarming. As with Media Bias Fact Check’s extensions, users should be wary that ZenMate’s ratings are by nature subjective. The concept of “bias” is likely more complicated for an algorithm to score. A former Duke Reporters’ Lab researcher has created a new tool to help readers discover the story behind the story. Gautam Hathi, Trinity ‘17, has just published StoryTracer in the Google Chrome web store. The tool, a free extension for the Chrome browser, identifies source reporting behind news stories on the internet. 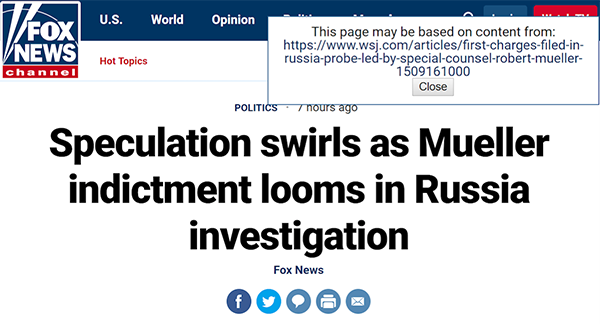 It works by checking whether links embedded in online news articles connect to similar content elsewhere. When users navigate to a webpage, StoryTracer will try to pinpoint the original source by examining the links on the page. If a likely source is identified, a pop-up will appear to indicate that the page might be based on content from one or more other sites. When links connect to sites that are not related to the webpage at hand, StoryTracer does not highlight them as likely sources. “It does this repeatedly, so once it follows a link, it will look at all the links on those pages and so on,” Hathi said. Hathi, who studied computer science at Duke and currently works as a software engineer, started the project in April. He said the idea came out of conversations with colleagues at the Reporters’ Lab and The Chronicle, Duke’s independent student newspaper. His first reason for initiating the project was to contribute to the fight against fake news. Hathi said he also wanted to help deliver credit to publications responsible for original reporting. While a writer for The Chronicle, he often watched as local — and sometimes national — news outlets based stories off the paper’s reporting. “It was always frustrating to us when others would use our reporting and basically get to publish the story on their sites, using the work that we had done without really giving us as much credit as we could have gotten,” he said. The ultimate goal behind StoryTracer is to elevate readers’ understanding of the news they are consuming, Hathi said. The code for StoryTracer is available on GitHub, so beta testers and users can set up and experiment with their own versions of the program. Feedback can be submitted through the Chrome Web Store. Hathi said he is hoping beta testers will help identify “corner cases where things might not work as expected.” He has already found some complex website designs that disrupt StoryTracer’s ability to locate source reporting. In its current form, StoryTracer can sometimes miss sources that should be recognized as original reporting. StoryTracer is not Hathi’s first experiment with projects designed to facilitate news consumption. In 2016, he built FactPopUp, a tool that allowed fact-checking organizations to provide live automated fact-checks via Twitter to users watching the live stream of a political event on their computers. He also contributed to the initial programming behind Share the Facts, a widget that helps users spread fact-checks across the internet. A lot of good fact-checking took place last year at the local level. But good luck finding it. Regional fact-checkers are not using basic digital publishing practices — such as landing pages, tagging and social media — to promote their fact-checks, according to a report co-authored by Duke Reporters’ Lab co-director Mark Stencel and research coordinator Rebecca Iannucci. The report, published by the Poynter Institute on Oct. 16, was derived from work by the Lab’s student researchers, who reviewed nearly 40 regional media outlets that fact-checked political claims during last year’s election cycle. 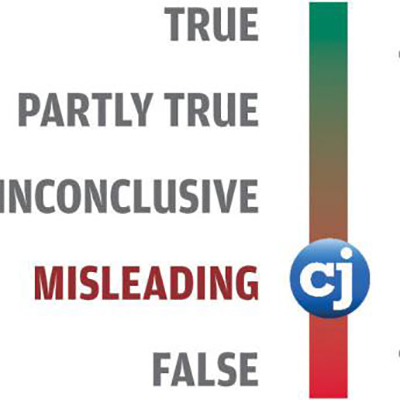 One of those outlets, The Topeka Capital-Journal, did have a landing page for its “Kansas Fact Meter.” But the landing page was inactive and did not showcase the majority of its fact-checks dating back to 2014, or the ones it published after January 2016. Tim Carpenter, the Capital-Journal’s Statehouse Bureau Chief and the founder of the Kansas Fact Meter, said he did not know the fact-checking project had a landing page, but he admitted it might be beneficial to have one. The Lab’s report noted that local news organizations that partnered with PolitiFact as one of the national fact-checker’s state affiliates got a boost from working with a website that was already structured in ways to help generate traffic. But half of the state and local fact-checking sites the Lab’s student researchers reviewed were more like the Kansas Fact Meter — a standalone project, often championed in the newsroom by handful of journalists, like Carpenter. Carpenter said he wished regional news organizations had more technological resources and research assistance at hand in order to make fact-checks easily accessible. The John S. and James L. Knight Foundation, the Facebook Journalism Project and the Craig Newmark Foundation are awarding grants to the Duke University Reporters’ Lab for a $1.2 million project to automate fact-checking. The Duke Tech & Check Cooperative will bring together teams from universities and the Internet Archive to develop new ways to automate fact-checking and broaden the audience for this important new form of journalism. The Reporters’ Lab will also coordinate and share its automation efforts with journalists and computer scientists across the country and around the world. The Tech & Check Cooperative will connect the leaders of similar projects through its relationships with the International Fact-Checking Network, the global association of fact-checkers, and awardees of Knight Prototype Fund grants to address misinformation. The Lab will host an annual meeting and will hold regular video conferences. Knight has provided $800,000 for the project and the Facebook Journalism Project has contributed $200,000. The Newmark Foundation has pledged $200,000. “A multitude of people and solutions are required to tackle the problem of misinformation in the digital age. The Reporters’ Lab is tackling the issue through an effective, multi-pronged approach, bringing together a network of journalists and technologists to build new tools that will promote the flow of accurate news, while strengthening their connections with major technology companies,” said Jennifer Preston, the vice president for journalism at Knight Foundation. The Tech & Check Cooperative will incorporate technology and content developed in Share the Facts, a Duke Reporters’ Lab partnership with the Google News Lab and Jigsaw. Share the Facts provides a way for the world’s fact-checkers to identify their articles for search engines and apps. ● The University of Texas at Arlington, which has developed ClaimBuster, a tool that can mine lengthy transcripts for claims that fact-checkers might want to examine. ● The Internet Archive, which will help develop a “Talking Point Tracker” that will identify factual claims that are used repeatedly by politicians and pundits. ● Truth Goggles, a project created by developer Dan Schultz and the Bad Idea Factory to provide pop-up fact-checking for articles on the web. ● Digital Democracy, an initiative of the Institute for Advanced Technology and Public Policy at Cal Poly-San Luis Obispo, which will develop ways to identify factual claims from video of legislative proceedings in California. The Facebook Journalism Project was created in January 2017 to establish stronger ties between Facebook and the news industry. FJP focuses on three pillars: collaborative development of new products; tools and trainings for journalists; and tools and trainings for people. Craig Newmark is a Web pioneer, philanthropist, and leading advocate on behalf of trustworthy journalism, voting rights, veterans and military families, and other civic and social justice causes. In 2017, he became a founding funder and executive committee member of the News Integrity Initiative, administered by the CUNY Graduate School of Journalism, which seeks to advance news literacy and increase trust in journalism. The Duke Reporters’ Lab is a project of the DeWitt Wallace Center for Media & Democracy at the Sanford School of Public Policy. The Lab conducts research into fact-checking and explores how automation can be used to help journalists and broaden audiences for their work. The Global Fact 4 summit came to a close Friday, after much reflection on the last year of fact-checking and discussion about future advancements in the industry. Ana Pastor, director and anchor of Spain’s El Objetivo, and Guillermo Solovey of the Instituto de Cálculo held a Q&A on the rejection of facts by polarized populations. Later, Tom Rosenstiel, executive director of the American Press Institute, argued that individual claims should no longer be the “atomic unit” of fact-checks. Following a presentation by representatives from Facebook and Google, and a panel on fake news, the day ended in a standing ovation for Alexios Mantzarlis, director of the International Fact-Checking Network and the organizer of the conference. Below is our final roundup of noteworthy moments from the summit, from social media interactions to memorable slides. Áine Kerr, manager of journalism partnerships at Facebook, and Philippe Colombet, head of strategic partnerships for news and publishers at Google, held a joint panel on how their respective platforms could benefit fact-checkers. During the Q&A, Mantzarlis asked the two technology experts if they would be willing to share data and metrics concerning the impact of their news initiatives with journalists. After Kerr and Colombet struggled to provide a definitive answer, some fact-checkers tweeted their concern about the lack of transparency between tech companies and the media. Phoebe Arnold, head of communications and impact at Full Fact, documented the moment in the tweet above. Aaron Sharockman, executive director of PolitiFact, led a presentation called “Funding for fact-checking: beyond foundations,” to teach resource-deficient organizations how to generate revenue, capitalize on crowdfunding and find investors. To emphasize his message, Sharockman put up a slide with a personal quote: “You cannot begin to charge for something until you know what it actually costs.” Sharockman’s parting advice to fact-checkers was to know their own value in the current political landscape and to take advantage of the increased awareness of the industry. Trust was a central topic of Friday’s Global Fact discussions, particularly as it applies to the waning trust between fact-checkers and their audience. During Pastor and Solovey’s conversation, they both addressed a major frustration for fact-checkers: Readers often reject facts that don’t align with their beliefs, choosing instead to live in a “news bubble” that only accepts one side of an argument. “Realizing that something is a lie doesn’t change their perspectives,” Solovey said of readers who are deeply entrenched in their stances. Pastor also noted that “people don’t want their ideas questioned, they want them reaffirmed,” which contributes significantly to an audience’s lack of trust in fact-checkers and the collective media. 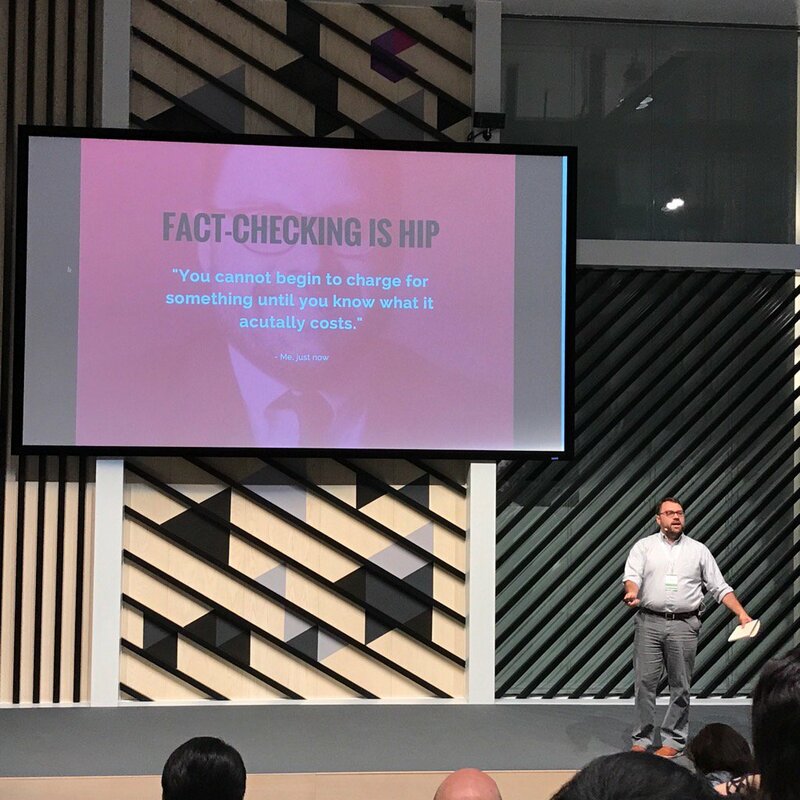 At Global Fact 4 in Madrid, we unveiled our new Share the Facts app for the Google device and six new languages for our widget. 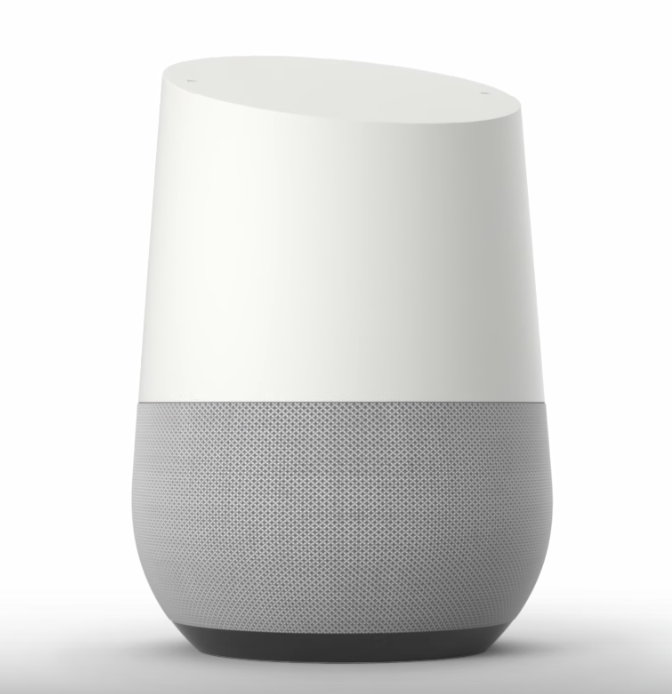 The new app for the Google Home taps the growing database of articles from the world’s fact-checkers to provide answers to voice queries. It is part of our Share the Facts project, which is expanding the reach of fact-checking around the world. The Google Home app features fact-checks of claims by politicians and other public figures from Share the Facts partner organizations, including PolitiFact, The Washington Post’s Fact Checker and FactCheck.org. The Share the Facts app, which is similar to one unveiled last fall for the Amazon Echo, uses natural speech recognition to analyze and answer questions from our database of roughly 9,000 fact-checks. We welcome feedback on the Share the Facts app for the Google Home by emailing project manager Erica Ryan. The app was unveiled at Global Fact 4 in Madrid, Spain, the annual meeting of the International Fact-Checking Network. We also announced that the Share the Facts widget, which has been available in English, French, Polish and Italian, now has versions in German, Spanish, Brazilian Portuguese, Indonesian, Hindi and Japanese. The project is a partnership with the Google News Lab and Jigsaw, a technology incubator within Alphabet. The widget allows fact-checkers to get a “Fact Check” tag for their content in Google News and search results. Google uses the “Fact Check” label, launched in 2016, to find and distribute accurate content and to increase the visibility of quality journalism. The widget also offers other benefits for fact-checkers. Each widget is a concise summary of a fact-check that can be shared on Facebook and Twitter. Participating fact-checkers can also be featured in new products like the Share the Facts apps for the Google Home and the Amazon Echo. Three partners are testing the widget in the newly available languages: Aos Fatos of Brazil, Wiener Zeitung of Austria and El Confidencial of Spain. We hope to expand the widget soon to publishers in Indonesia, Japan and India. Organizations interested in using the Share the Facts widget can find more information on the Share the Facts website or by emailing team@sharethefacts.org.